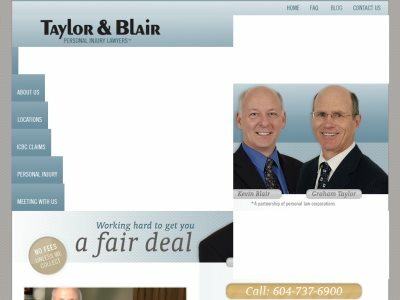 Taylor & Blair is a personal injury law firm in Vancouver, British Columbia. Branch offices in Burnaby, North Vancouver, Port Coquitlam, Richmond, Surrey. With more than 40 years of collective legal experience. Practice Areas: ICBC Claims and Personal Injury. Type of accidents and injuries: Auto, Bicycle, Boat, Bus or Taxi, Fractures, Head injuries, Hit & Runs, Loss of Life, Motorcycle, Paraplegia, Pedestrian, Quadriplegia, Spinal cord injuries, Slip & Falls, Whiplash and other soft tissue injuries.